Desk Lunches was started by two friends who were tired of takeout. On alternating days, they prep and cook healthy-ish, make-ahead lunches in their tiny NYC kitchens. Here, they share their favorite recipes and easy tips for successful office-friendly packing and serving. Share your own #desklunch ideas on Instagram. This is our go-to sweater weather lunch. Infusing store-bought chicken stock with ginger adds a little spice and makes it taste like it's been simmering all day. Of course, if you have homemade stock, that’s also a great starting point. Roast the Chicken: Rub 2 bone-in, skin-on chicken breasts with EVO and season with salt and freshly ground black pepper. Roast in a 350 degree oven for 35 to 40 minutes. Once cool, shred the meat into big pieces with your hands. Transfer the bones into a large pot. Store the shredded meat in a quart container in the fridge overnight. Infuse the Stock: In the pot with the chicken bones, combine 1.5 to 2 boxes of low-sodium chicken stock with a couple of whole, unpeeled cloves of garlic, 1/2 of a small, unpeeled yellow onion, a few big slices of peeled, fresh ginger, one piece of celery snapped in half and a few whole black peppercorns. Simmer for an hour, letting the flavors infuse into the stock. Season generously with salt. Strain through a fine mesh strainer, let cool and store in a couple of quart containers in the fridge overnight. Prep the Rice Noodles: In a large bowl of very hot water, soak a package of rice noodles until pliable (about 30 minutes). Drain and store in a quart container in the fridge overnight. Prep the Vegetables: Wash a few heads of baby bok choy and a handful of scallions. Spin-dry and store wrapped loosely with paper towel in zip-top bags in the fridge overnight. AT THE OFFICE: Heat the broth until superhot in the microwave. 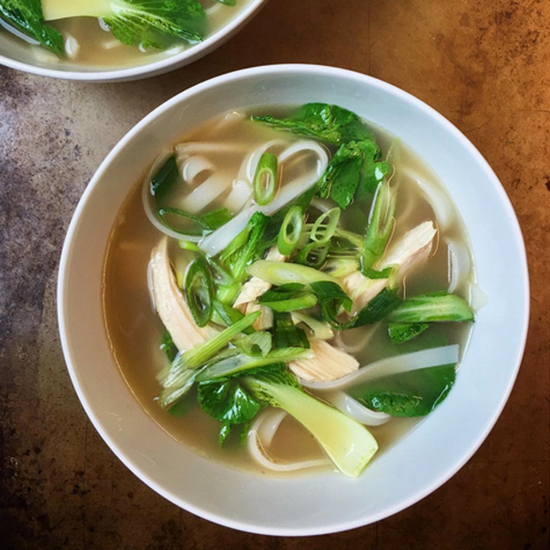 Add the noodles, chicken and bok choy (the heat of the stock will warm the ingredients and make the bok choy crisp-tender). Garnish with sliced scallions (we keep a little cutting board at our desk for quick chopping! ).